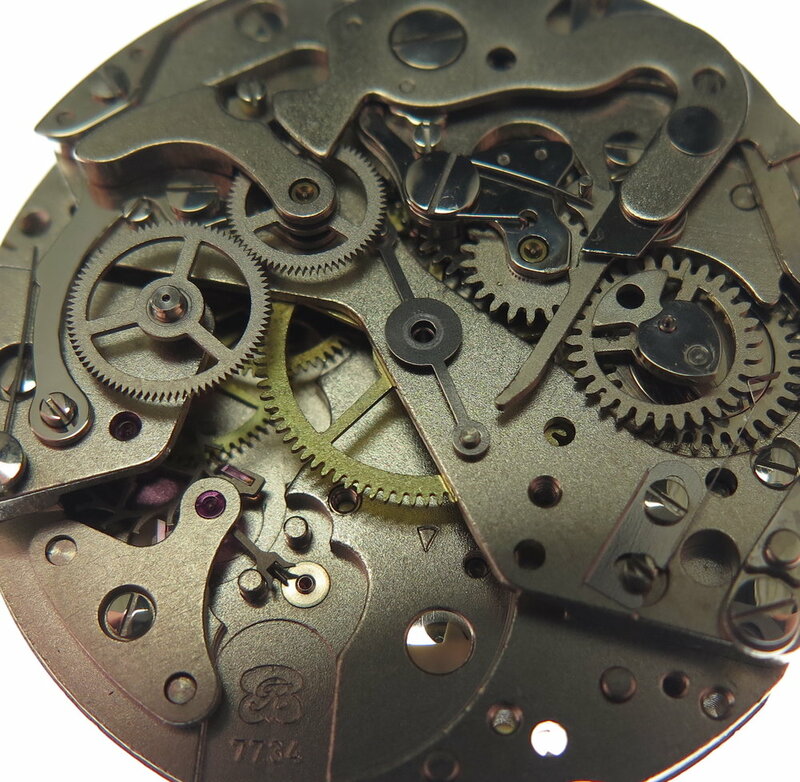 An example of an industrially executed cam driven chronograph. The name Valjoux comes from "Vallée de Joux", a mountain region of Switzerland associated with chronograph design and construction. Valjoux was founded in the "Valley de Joux" in the mid-to-late part of the 19th century. When the watch business collapsed in the latter half of the 20th century, Venus chronograph manufacturer failed and Valjoux bought them, thereby Valjoux attained the rights to the new cam/lever and switch of Cal 188 that Venus had made. This was rebranded as Val 7730 and sold for a year or two until the Valjoux redesign of this movement was made - the 7733. Cam assembly, replacing the pillar wheel. Chronograph wheels. Triangular profile for ease of meshing when the chronograph is activated. Screws & Eccentrics. The first screw holds a wire spring in place. Under dial. Showing the calendar mechanism. Calibre. Found under the balance wheel. The -R- symbol in its shield always signifies Valjoux, today owned by ETA. Chronograph seconds wheel removed from the image. Friction spring. To add tension to the chronograph wheel to take up any slack.. Brake. For the chronograph wheel which touches this wheel when the watch is -stopped- to prevent it moving instantly. Chronograph wheel bridge. Which holds the pivoting axes for the chronograph wheel and the minute recorder. Only one is jewelled, the other is bushed. Stud and index. More recently the balance springs are differently held in place, but for several hundred years they were pinned as shown. Intermediate wheel. Pushed by the finger piece on the chronograph wheel intern turning the minute recorder wheel carrying the minute recorder hand. Intermediate wheel. Underside, the small bridge holding the wheel in place is formed by a stamping process, crude in finish but exact in precision. Chrono-plate. Covering the ratchet wheel granting the additional chronograph components surface area. Under dial, calendar removed. View showing the mainplate dial side with the calendar removed. Calendar bridge. Which holds all the calendar parts in place.